In this Black Box Stocks Review we will discuss why we think they may have the best automated trading algorithms for their alert system! BlackBox Stocks automated trading scanner is one of the most user friendly stock and options alerts tool on the market. Does that mean it’s going to print money for you? No! You still need to know the ins and outs of trading. However, what it will do for you is keep you informed on the biggest moves in the market on a daily basis. It’s up to you to take the information, process it, and trade the best setups. Of course, learning to trade takes time, and the same goes for any new trading tool. Slow down! Take your time to get adjusted to the new information in a new tool. You’re only human after all! BLACK BOX STOCKS REVIEW – THE BEST AUTOMATED TRADING ALGORITHMS? Black Box Stocks automated trading scanner was founded in 2011, and since then has grown to be a major contender in the world of trading tools. They offer a LOT with their service. Their real time, web browser and mobile based automated trading algorithms are the backbone of their alert system and supply day and swing traders with some of the best analytical software out there. Let’s take a look at some of the simple and easy features. The premarket trading service scanner will show you all the biggest NASD/NYSE movers of the morning (they also have a POST market scanner as well). You want to make it part of your daily ritual checking what stocks are moving in the pre market while you begin your technical analysis. Mark out support and resistance and prepare for the days battle which will make you better at stock trading! You can also get the StockTwits feed for any ticker by clicking the ST symbol in the bottom right hand corner. Keeping an eye on the Social Media sentiment is helpful when watching what the “herd” is up to. This will save you from having to open another browser tab to view StockTwits directly! Or you can just ignore it. You’ll find sometimes people share nice charts, or links to news on the feed. We share their stock scanner in our trade rooms several times per week when we are trading live. If you are looking for the biggest advances in stocks and decliners too, take a look at the Market Movers tab. Here you will find stocks with a wide daily range, perfect for momentum, high or low RSI levels, exhaustion, or reversals. You can check this throughout the day and click on each one to quickly populate a chart. Traders want volatility. There is nothing worse than hopping in a trade and having it trade sideways. Unless of course you are an options premium seller. 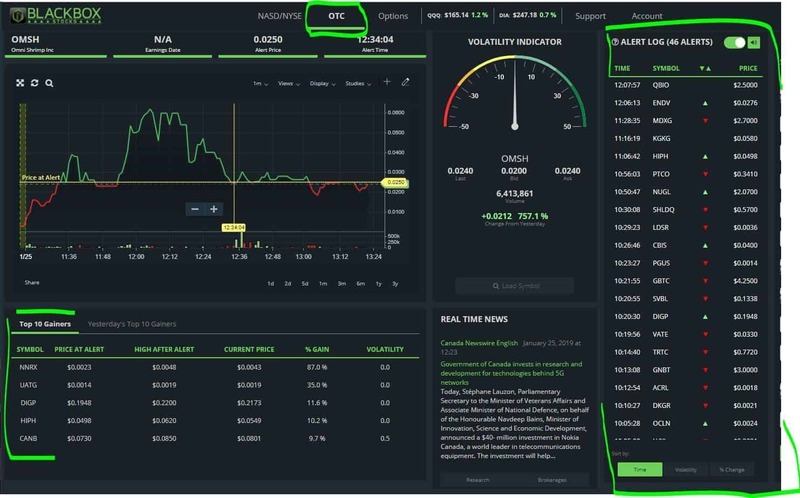 When you’re watching the BlackBox stocks Scanner, its nice to know you are watching the real time quotes, as well as their real time volatility indicator. The volatility indicator is awesome for knowing if the movement is stronger in terms of Bullishness or Bearishness. This dial is something you should study for a bit to get the overall “feel” of the speedometer. You may find it helpful watching it along with price action. For example, today on $AAPL we noticed some bearish candlesticks but the volatility indicator was fairly neutral. This signaled the neutralizes of the move, which MAY of kept you in a trade, or on the sidelines! What is cool about the alert log, is you can also click and sort by volatility. Or time and also volume. When you sort by volatility, you’ll see some ratios which could be helpful in finding the most volatile stocks of the morning. As an options scanner, BlackBox Stocks automated trading scanner shines. Actually they could change their name to BlackBox Stocks and Options and it would make a lot of sense! Just today I traded Apple options based on some of the options “flow”. Below is a picture of some of the options flow that attracted me into the stock. What I saw on AAPL met all of my checklist criteria. Increased volume. An extended hours gap up. A wedge pattern. Price right at moving average support and right below angular resistance. Next, once the market opened I filtered the BlackBox stocks options scanner to just show me some $AAPL flow. Subsequently, you can highlight different boxes at the bottom. Flow is highlighted to give me the trades that are being placed in real time. No delay! Ever! Based on the chart setup and the flow. I entered 5 calls on AAPL for a 1/25/2019 expiration. Short time options trading is considered extremely high risk, and you should not attempt it unless you are experienced. As always, paper trade first and read our getting started page before you ever attempt to trade with real money. Here’s a link to my trade ledger confirmation. I posted this info in our live trade room for our members! Here at the Bullish Bears we aren’t about the money. We just want to help people figure out trading and see them succeed. So this is the beauty of the options scanner. You can chart your stock, find your “trading edge setup” then check the options flow for some confirmation of what the “big money” is doing. Finding options flow that lines up with your setup is key to using the BlackBox Stocks options scanner. However, don’t trade just to trade. Know what each category means. With this in mind realize that there are swing traders and premium selling options traders who are also ending up on the tape. Knowing how to interpret that is going to be important to your success using the scanner. Remember, it’s all how the information from Blackbox stocks lines up with YOUR trading edge! One of the cool features for penny stock traders is the OTC scanner setting. You have to accept their disclaimer first before you activate the scan setting. But once you do that, you are up and running. You’ll find all the hot moving penny stocks of the day. Once that is unlocked you’ll see the top alerts in the bottom left hand corner that cover the top penny stock alerts. You’ll also find the alert log, and volatilty indicator. Some of these stocks have huge gains! Take a look at OMSH. Up 750% from yesterday. Penny stocks can be shorted to, so it’s not just for long traders. You may want to short some of the stocks you find on this scanner as well. Be sure you know the risks ahead of time with OTC. Do your research before you buy and sell anything! The BlackBox Stocks automated trading scanner was designed by traders for traders. What makes it so special is there is an entire team of traders on a discord server who are extremely helpful and knowledgeable. When you sign up for BlackBox you’ll get access to the scanner as well as access to their private discord server. On the private discord server there is voice chat, and you’ll have the opportunity to talk with others, hear call outs, analysis, and much more. They also have Q and A sessions, private twitter alerts, and weekly webinars. If you have questions about the platform they are there to help! They want to see you succeed in the long term and understand the scanner. So take advantage of the discord while you learn the best way to use the BlackBox Scanner!